If your are the author of the script, you may leave the "Real Author" field empty. If not, please indicate the name of a real author in this field. Give a meaningful name to the published topic and its short description. Give a short comment to the code, so that users could easier understand it. It is preferable to insert illustrating pictures. The published charts with indicators or graphical objects should be black-and-white: white background, black-and-white candlesticks or black bars. This allows screen printing of the picture. If further you need to change the publication, simply click "Edit". For replacing an attached file, delete it and attach the needed number of new files. A short video demonstrates the publication process. • Give a meaningful name to the published topic and its short description. • Give a short comment to the code, so that users could easier understand it. • It is preferable to insert illustrating pictures. • The published charts with indicators or graphical objects should be black-and-white: white background, black-and-white candlesticks or black bars. This allows screen printing of the picture. If further you need to change the publication, simply click ‘Edit’. For replacing an attached file, delete it and attach the needed number of new files. How nice if mql4 over version control of the code. believe this way more developer would love to use the system. I am sure any indicator/expert has to be modify by time to time. and we like to keep all version to display under same idea. Just my two pips. #property copyright "Copyright © 2005, rodrigokaus"
1. The first I would like to publish but can find no publish button or other means of publishing - One could assume that it is sitting in a queue, but if its ready for publication would it not have been submitted automatically. The second, also (ready for publishing) have been sitting in the My own box for a number of days. Neither have been published. 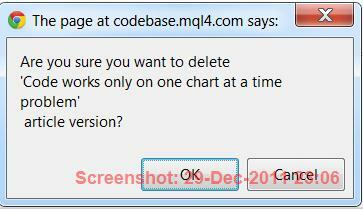 but the project 'code works only on one chart at a time problem' does not delete and remains in the My own box. ? The video not in English does not appear to address items I and 2 two above. Thanks in advance for any answers to 1 and 2. Many thank for a magnifecent facility. ** Just noticed this but will leave the above as previous posts suggest some confusion. So - ready for publishing but waiting for proofread. However, question 2 remains - How to delete the other article ? Perhaps ability to delete once proofread completed ?